He recognized that as artists are inspired by nature, when we look at their work, we are experiencing their connection with the cosmos through their eyes. The artists of this exhibition, centered around this idea, have created work capable of transporting the viewer to their own natural worlds filled beauty, mystery, and wonder. Naoto Hattori is famous for his captivating Pop-surreal style combined with an adept photorealistic touch. His dreamlike creatures tell us stories of their own mythology through their physical anomalies and habitats. The detail in his work allows us to dispel our disbelief and draws us in to delight in his mystifying universe. "My vision is like a dream, whether it's a sweet dream, a nightmare, or just a trippy dream. I try to see what's really going on in my mind, and that's a practice to increase my awareness in stream-of-consciousness creativity.” When viewing his piece for this exhibition, Critical Hit, we are swept away in the narrative of a Phoenix-like creature caught in a moment of surprise, with a forest reflected in its eyes. Beautiful and haunting, his work takes us to a different plane where anything is possible if it can be imagined. Likewise, Ania Tomicka creates worlds and characters that are mystifying and elusive. Inspired by emotions, music, and her own imagination there is something truly lyrical hidden in her work. Her piece Fire Spirit, captures an intimate moment of appreciation between a girl and the beauty of nature. Witnessing this peaceful scene is her curious fire spirit companion who is loyally perched along side his friend. It’s a beautiful depiction of peaceful change and transition as the warmth of their presence transforms the colors of the trees into fiery auburns and gold. Similarly, Los Angeles based Korean artist Joanne Nam’s paintings also carry deep emotion and haunting beauty that capture moments of reflection and contemplation. The stark lighting in each piece highlights the contrasting elements felt from each painting. All at once peace and unseen chaos collide to create these charged pieces that feel hopeful in spite of their melancholy. This tension instantly allures the viewer and wraps them in a moment so enchanting, it’s hard to break away. In a similar way, international artist Paul Barnes effortlessly combines hauntingly adorable creatures with a historical aesthetic that is rich with folklore and depth. His subdued color palette on textured plaster is immediately recognizable and unique. He brings tales and myths from long ago to life and appeals to our inner child, fascinated by these eerie legends. Every artist in this exhibition uses their immense talent to transport us to worlds where our imagination can be free to wander and roam. Inspired by nature and our communion with it, the works in this show personify the beauty and force that lies all around us. These artists teach us to look with new eyes, by allowing us to look through theirs. Each one has seen and heard something different, but all are responding to the same Language of Nature that calls to us all. Many thanks to Zach for featuring The Language of Nature on Supersonic! Click here to read. 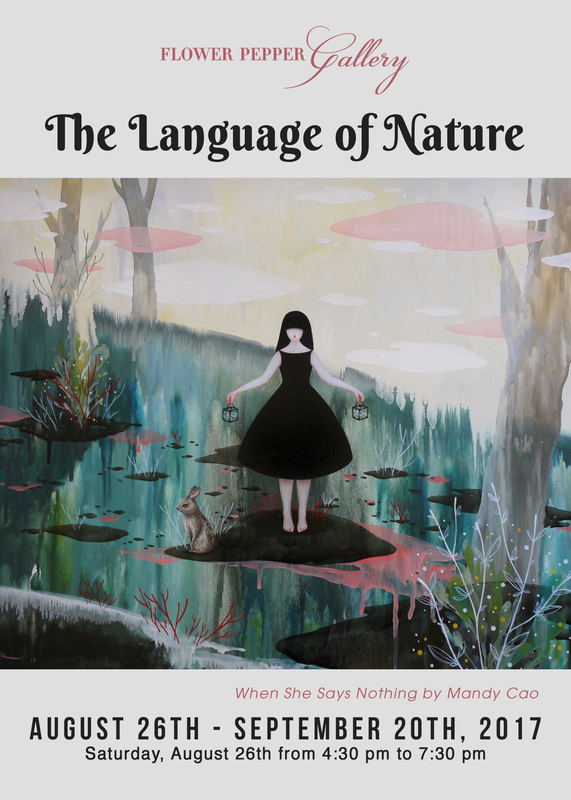 The Language of Nature has been picked to be a Featured Show from August 28th to September 2nd on Artsy's main show page. Many thanks to Artsy for the support! Click here to see. Click here to see The Language of Nature's Artsy Page.